Speak Up! Why is Kansas City Giving Transit Money To Public Works, AGAIN? Transit Action Network plans to testify at both public hearings. Please consider letting the council know what you think about this diversion of transit money to Public Works. This time last year, the 2014-2015 Budget looked fine, no problem. KCATA was being allocated an appropriate amount of money based on the calculation in the ordinance. This week we got a look at how the City Manager is actually using the sales tax receipts. In the Submitted Budget there is another column – the Estimated actual revenue and expenditures for 2014-2015. This Estimated column shows Kansas City ½ cent sales tax Public Mass Transportation Fund, on page 382 of the Submitted Budget, has finally made a good recovery from the recession. Instead of the budgeted amount of $32.8 million in receipts, the city is now estimating it will receive $36.5 million this year. That is great. Kansas City hasn’t been able to collect enough sales tax since 2009 to pay for the current level of transit service. However, we don’t see any increase in KCATA funding to reflect the windfall. In fact, the estimated final amount is $808,000 less than originally budgeted. This is so unfair and wrong! 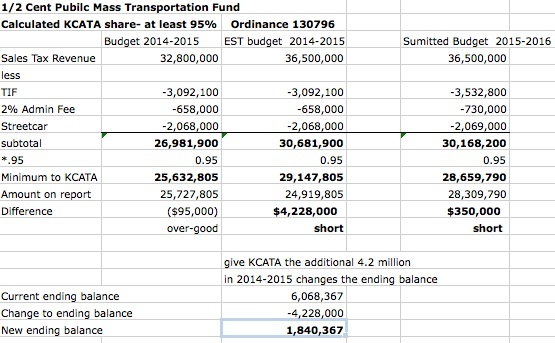 Re-calculating the KCATA funding using the new sales tax revenue amount, KCATA should get $29.1 million, but it is only estimated to get $24.9, which is $4.2 million less than it should receive based on the ordinance. So while KCATA funding is slashed, the city is giving Public Works $1.36 million more than its 5% this year and $4.7 million over its 5% next year. The city is currently expecting to finish 2014-2015 with a revenue increase of $3.7 million over budget in this fund. budgeting the same sales tax revenue as estimated for 2014-2015. Public Works is getting $6.2 million out of this fund, when it calculates a maximum of $1.5 million. KCATA is getting $350,000 less than required by the formula. So how does this happen? The city manager and TAN read this ordinance very differently. TAN – KCATA receiving 95% of the proceeds from the sales tax means just that. Budgets are estimates of what the city thinks is going to happen. When it gets actual numbers the amount gets adjusted based on the ordinance. That is normal. City Manager reply to TAN on Wednesday: The amount calculated for the budget is a fixed number and he won’t re-calculate it. Any additional money that comes in allows him to direct it to Public Works. We find that position almost unbelievable. His position is if the city does a really bad guess on the budget revenue number, like this year, then KCATA has to suffer and all the additional sales tax generated by the people is available for Public Works. Is he really going to stand by that? We think the city manager’s contorted reading of this ordinance fundamentally wrong. Even his reasoning implies that if the budget projection for sales tax revenue was close to being right, then KCATA would have gotten all this money. So why shouldn’t KCATA receive it now? If the budget department is way off on the sales tax revenue estimate, KCATA shouldn’t suffer and Public Works shouldn’t get the windfall. The city council made it clear by the ordinance that this money is meant to support transit. The 5% for Public Works is traditional because Public Works does services that are beneficial to the transit such as snow removal. This money is not meant to be a slush fund for Public Works. Repeated diversions of transit funds by blatantly ignoring ordinances makes us wonder if that isn’t the best term to describe what goes on in this constant battle to maintain transit funding. Transit advocates shouldn’t have to keep having this same fight. When the media and other people complain that transit isn’t as good as they think it should be, maybe they should look at the city for diverting so many millions of dollars since 2003 from the of ½ cent Public Mass Transportation Fund and giving it to Public Works instead of using it to provide transit service. We need to establish the correct use of the calculation in the ordinance because otherwise when there is more revenue than budgeted, the city manager will continue to divert the money to Public Works instead of using it to improve transit. 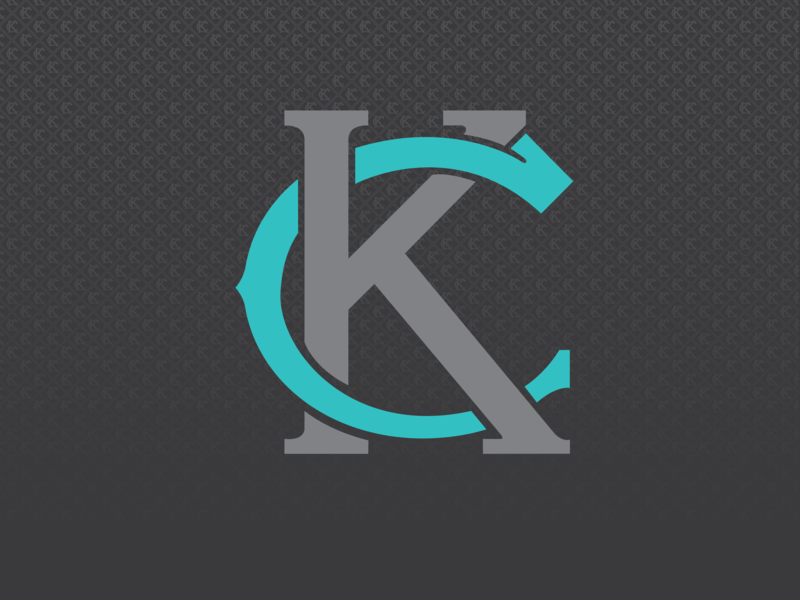 2014-2015- KCMO is finally raising enough sales tax to cover the current service level, but it is not paying its bill. Every year since 2009 KCATA dipped into its reserve account (city money held for an emergency, like we had in 2009) to pay the difference between what the City gives them and what the transit service actually costs. Why wouldn’t the $4.2 million automatically go to fully pay the city’s bill and stop KCATA from depleting its reserve account? 2015-2016- KCMO funding will barely cover the cost of the transit service, but that is still great since that is the first time it happened since 2009. In 2009, transit service was cut 9.5% due to the recession. That service level has never been restored. We are limping along with far less service. Prospect Max – We need about $9 million for the local match (20% of $43 million) to build this line, then we need an additional $500,000 per year to run a MAX line instead of the current route which costs $5 million. (Prospect MAX will be $5,500,000 yearly to operate) If the current local service continues at some level, even more money is needed. Since Independence Ave and 31st St/Linwood are such great transit corridors that the city believes they deserve a streetcar, they should at least be upgraded to MAX lines. We need to increase frequency on routes to increase ridership and make this a functional transit service. Routes with 1 hour or 30 minute frequencies will never be well used. There is more, but you get the picture. The City Manager and TAN agree on what happens if the budget amount is too high and the actual sales tax revenue is less. Under that situation, the city should use the money it held in reserve to maintain the budgeted amount as a minimum payment. Since KCATA can receive at least 95% of the sales tax, it can get a higher percentage, so the budgeted amount should be the minimum KCATA receives, Once those funds are exhausted, that would constitute a funding emergency, like the recession in 2009, and KCATA could use its reserve account to maintain service levels. This entry was posted on February 20, 2015 at 4:45 PM	and is filed under Action, Local Transit Issues. Tagged: Kansas City, KCATA. You can follow any responses to this entry through the RSS 2.0 feed. You can leave a response, or trackback from your own site.